A Facebook page calling for violence against 102 Muslim men who are allegedly in relationships with Hindu women has been taken down. The page, which asks Hindus to "track and hunt the boys on the list", prompted outrage online. The list also included links to the Facebook profiles of those named, raising concerns about their safety. Although the page is named "Hindutva Varta" (Hindutva Talk), no Hindu right-wing group has owned up to it yet. The list appeared on social media feeds over the weekend after a Twitter user called attention to it. "Hindu terrorists publish a long list of inter-community marriages and urge Hindus to kill the husbands of these women," the tweet read. While the page is no longer available, Indian website Alt News has archived a few of the posts, including the list but has blurred the names of the couples. All of the archived posts encourage violence against instances of so-called "love jihad". "It's alarming that such a list exists in the first place," Pratik Sinha, cofounder of Alt News, told the BBC. "But to think that someone has spent their time tracking down the names of people in such relationships is equally troubling." The list links to individual Facebook profiles of 102 different Muslim men and Hindu women. The list seems to have been compiled based on the "relationship status" listed by these individuals on Facebook. This is not the first time such a list has been circulated online, according to Mr Sinha, who said it was spotted in November 2017 on another right-wing page called "Justice for Hindus". But it was not accompanied by a call for violence then. "This is how social media propaganda gets created, as lists like this get circulated from one page to another," he added. One previous post on the same page includes a call to Hindu parents to teach their daughters to use guns so they can protect themselves against "love jihad". In another post, a video shows a Muslim man being violently attacked by a group of men. Marriages between Hindus and Muslims have long attracted censure in conservative Indian families, but the attachment of a deeper, sinister motive to them is a recent phenomenon. 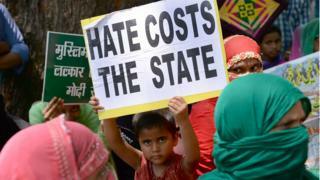 In recent years, they are increasingly being labelled as examples of alleged "love jihad". A man was hacked to death over an alleged inter-faith relationship, and a Hindu woman killed herself after she was bullied on WhatsApp for having a friendship with a Muslim man. In 2017, a lower court annulled the marriage of a Hindu woman who converted to Islam and married a Muslim man. The case eventually made its way to India's Supreme Court amid allegations that the man was linked to terror groups.